Don't Stop the Carnival is a live album by jazz saxophonist Sonny Rollins, recorded at the Great American Music Hall and released on the Milestone label in 1978, featuring performances by Rollins with Mark Soskin, Aurell Ray, Jerome Harris and Tony Williams with Donald Byrd joining on five tracks. The Allmusic review by Scott Yanow wrote that the "versions of 'Don't Stop the Carnival' and 'Autumn Nocturne' are memorable but most of the rest of the set, although spirited, is a bit lightweight". Music critic Robert Christgau wrote "the meat of the album is sustaining if not exquisite, jazz food that anyone can digest." 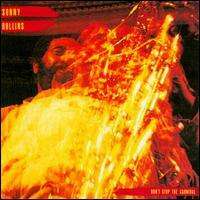 ↑ Sonny Rollins discography, accessed September 25, 2009. 1 2 Yanow, Scott. "Don't Stop the Carnival > Review". Allmusic. Retrieved June 26, 2011. 1 2 Christgau, Robert. "Don't Stop the Carnival > Review". Robert Christgau. Retrieved June 26, 2011. ↑ Swenson, J. (Editor) (1985). The Rolling Stone Jazz Record Guide. USA: Random House/Rolling Stone. p. 172. ISBN 0-394-72643-X. This article is issued from Wikipedia - version of the 6/2/2015. The text is available under the Creative Commons Attribution/Share Alike but additional terms may apply for the media files.